Although Dutch historians seem hesitant to use it, when analysing associational life and political development in the long 19th century the concept of civil society is preferable to that of public sphere, because civil society includes those citizens who, for a long time, did not participate in political life in the narrow sense, such as women and working-class men. Following a review of Stefan Hoffmann’s Civil Society: 1750-1914 (2006), some suggestions are made as to how Dutch history fits into this book, and how a history of civil society can be conceived, researched, and written. Dutch historians do not consider civil society as a separate social world, but as part of a society where the state has had a benevolent role. Unlike Tocqueville they do not consider societies as a safeguard that prevented democratization from turning into dictatorship of the majority. Moreover, the liberal concept of civil society supposes a sharp distinction between state and society, but Dutch socialist and religious political parties acted as a link between the two. They became the nucleus of a world of ‘pillarized’ organizations which formed an intermediate level between state and citizen, but often had a clear connection to the state. Stefan-Ludwig Hoffmann’s work on civil society is important and stimulating because of its international focus, and because it fundamentally questions the facile relationship between voluntary associations and liberal democracy. At the same time, Hoffmann, in stressing international similarities, downplays the role of national or regional actors (such as the state) which help account for the different effects of civil society that Hoffmann notes. Religion, too, as a variable factor in the development of civil society receives short shrift. Farmers, townspeople and countryfolk. The ‘spirit of association’ in the countryside. The countryside was not some kind of wilderness, inhabited by an undifferentiated mass of uncivilized peasants. Circumstances and mentality could differ from region to region and from village to village. In several Dutch villages leading groups took the initiative to found reading societies and recital societies quite early, and they had farmers among their members. Associational life, democracy, and the question of emotions. Remarks in response to Stefan-Ludwig Hoffmanns Civil Society. This contribution takes a closer look at the role of emotions in order to examine the significance of associations during the nineteenth century. What happened to their supposed capacity to ‘enlarge the citizens’ heart’? Is it true that the culture of sensibility was gradually replaced by one in which men, in particular, were expected to control their feelings and what would that mean for cultural effects of associations? 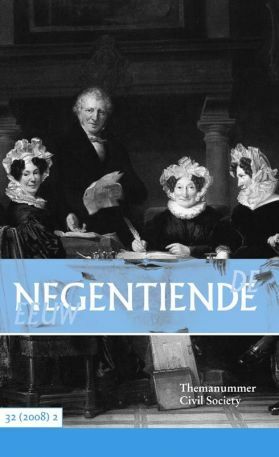 In the Netherlands the rise of civil society in the guise of the 19th century ‘herensociëteiten’ is strongly connected with the political strife between patriots and orangists in the late 18th century. Secondly a strong undercurrent of theocratic thought in Dutch Calvinism should be taken into account when assessing the divide between public and private, the more so because classical education was not apt to lead to a rift between the two. The tension between democracy and civil society is central for an understanding of ninteenth century ideas and practices of civil society in Europe. This becomes even more apparent if we include colonialism in our framework for historical analysis.